My intermediate class needed to start their design ideas today. We are designing and making 3D printed mobile phone stands. They have written their design brief (blog post here about how we wrote the design brief), and done some research comparing different styles of stand. We now need to move on to design some stands of our own. I thought that this would be easier to think about in 3D first rather than draw them on paper first. I prepared portions of plasticine, modelling tools, card, scissors, glue and some mdf pieces shaped to the size of a mobile phones. The students had to think about their design ideas and make them in 3D straight away. When I asked them what they thought of working this way instead of drawing first, there was a split. Some really liked it and some would have rather drawn some ideas first. They had not done design ideas like this before so it was interesting watching their reactions. Some launched straight in, some hung back, looking what others were doing, some tried things with the plasticine so they got to grips with the new materials first. We took photographs of their designs as we worked and put them into a shared folder on Google Drive so the students have access to photographs of their own work. It also lets them see the design work of others to give them ideas and support. The intention now is for the students to use these photographs as the starting points for some design analysis / good points / bad points and then move on to drawing developments of the ideas. It was a fun lesson and the students were thinking about their designs and how they would be used. 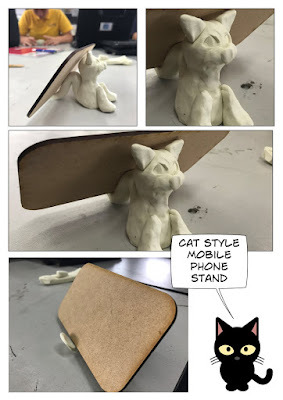 They were getting the angle right for viewing by making their design hold the mdf phone mock up. They were making the design support the phone well without slipping. They were thinking about what other use their design could have. No one used the card for models today as we were having too much fun with the plasticine.